The Power Of Gratitude by A Lamees | An honest book review. I have a great interest in Positive Psychology and as gratitude is one of the positive emotions that it encourages I was drawn to ‘request The Power of Gratitude by A. Lamees. ‘Unfortunately I found it didn’t grab me. 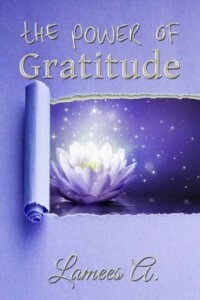 The content was thorough and full of ideas about gratitude, its place in everyday life and how to be more grateful, but although the content was useful in its breakdown of what gratitude is, its place in everyday living and how to practice gratitude in your own life, for me it lacked coherence and depth. However, this is only my opinion and other readers might well like to explore the ideas further. I give this book 2 stars out of 5. Jo is a qualified Primary School teacher and has a Masters Degree in English Literature. A mum of two who loves to read. Man Cave Thinking-A blog afor mid-life men: health, fitness and diy.